Another day, another geolocation app. But this one has a blunt answer to the frequently asked question: “Why would anyone want to ‘check in’ every place they go?” And that answer is cash. WeReward comes from the folks at Izea, a company that — for better and worse — wants to monetize the social web. But unlike their programs to inject ads into blogs or Twitter streams (of which I am not a fan), WeReward is a self-contained platform that’s transparent in its intent: bringing customers to local businesses via fairly conventional reward programs. If I check in at a restaurant (or post a photo of me holding some brand of soda), the business pays WeReward for my visit or post, and WeReward passes a few cents back to me. It’s simple, and everyone gets something out of it. But WeReward also has some downsides, and some blind spots (including the “social” part). As I blogged in exhausting detail in November, I’m obsessed with social geolocation services. Since my last write up, I’ve signed up for and played with nearly a dozen new sites and apps. In addition to Gowalla, Foursquare, and Brightkite, I’m now using the check-in feature of Yelp, giving Whrrl a second chance (after seeing them everywhere at SXSW), and beta testing the locally built EpicTracker. I’m also enjoying the slick, HTML5-savvy mobile web app Burbn, and feeling somewhat lonely on privacy-sensitive Rally Up. And there’s the very game-like MyTown, the charity-focused CauseWorld, and the anonymous (and recently funded) BlockChalk. Suffice it to say, it’s a crowded space. I have a full page of geolocation apps on my iPhone, and several have already dropped off over time. And I can’t possibly check into a dozen different services every time I arrive at a place (though I try, and the Brightkite spinoff Check.in has provided some relief). Most people aren’t as obsessive as I am, but most people will ultimately have to decide which services to use most often. A cash incentive is a heck of a differentiator, and a decent motivator. How Does WeReward Add Up? 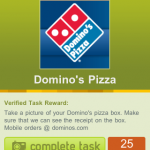 WeReward launched yesterday at TechCrunch Disrupt, and I’ve only played with it today. I’ve found and reported a couple of bugs, and I’ve earned 20 cents. Though obviously it will grow and gain new features quickly, here are my main, first impressions. Maybe it’s just me and my hippy-dippy self, but the up-front pitch that using WeReward will earn me cash is both an incentive and a disincentive. It immediately undermines the value of a ‘check in’ when I know a user may only have wanted to earn a few pennies, without liking or knowing anything about the business. WeReward also has a referral program, again a double-edged sword. If you join following the links in this post, I get a tenth of the earnings you make. Cool? Or uncool? This turns users into Amway salespeople, and makes any strong recommendation to join sound like a pyramid scheme. My inbox is full of invites to join yet another “Twitter that pays!” or “Facebook that pays!” This is “Foursquare that pays!” It should easily give anyone pause. The glaring hole in WeReward is the lack of a “friend view,” or any sort of internal social networking features. Sure, I can post my checkins to Twitter or Facebook, but in “sharing” my activity, I’m mostly promoting the business (which WeRule’s partners love). I can’t find my friends within WeReward, see where they’re going, or what they’re earning. I can only interact with WeReward and the businesses, not other users. This despite the fact that social links would obviously drive more activity. If I saw a friend earn 500 points with a stunt (say, writing a business name on my forehead), I’d be tempted to do the same. 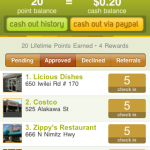 It would be natural to want to compete with others to do more and earn more points/pennies. And without the social piece, there’s no profile page, and thus, no public activity stream for users. As pretty as the check in page looks, you can’t click my avatar or username to see what else I’ve been up to. I’ll never know what my friends are doing if they don’t “share” their checkins on other services. This is such a glaring omission, I can only assume that it’s coming in a future version. 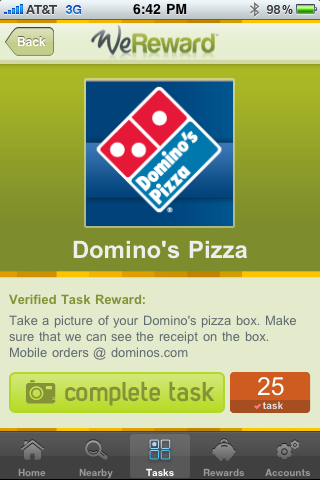 Check-ins in WeReward are moderated, apparently manually. So after I check in and post a photo at Zippy’s, it’s not official until someone WeReward approves it. On the plus side, this obviously limits cheating, and it’s probably necessary given their cash incentive. But the huge downside is that there’s a delay before my activity is shared. Even without a “friend view,” the value of posting my visit to Zippy’s to Twitter is practically nil if it actually happened a long time ago. My first check-ins this morning were approved within minutes, but by this afternoon, it took a few hours (darn time zones). The system is also up front on its throttling policy. 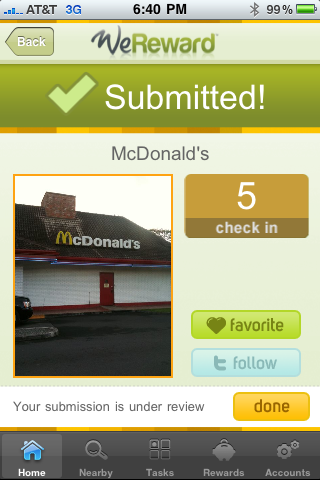 You can only earn points for five check-ins a day, and no closer together than 15 minutes. This sounds reasonable to me. An interesting differentiator of WeReward is that there are “tasks” as well as “places.” In addition to earning points by checking into a business, you can earn points by doing things. Examples? Post a photo of your Domino’s pizza box (and receipt), or a photo of yourself holding a bottle of Jones Soda, or a photo of WeReward.com written on a part of your body (“keep it clean,” they say). It’s fun to weigh whether I’d write on myself for 50 cents, and I like that you can play without leaving home. And it certainly gives advertisers a lot of creative leeway in reaching users, and a way to verify participation. I can easily Zippy’s calling for photos of bakery items. They might make some money selling a Napple, but the return in terms of customer engagement is even more valuable. 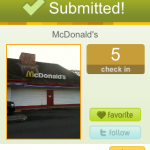 WeReward allows you to combine your check-ins with Foursquare check-ins. So if you’re a Foursquare user, you might as well use WeReward, and earn a nickel for the time you would have already spent checking in. If WeReward adds additional services like Gowalla, BrightKite, Yelp, and Whrrl, the value proposition would get even better. Cash or not, I’d love a service that can save me from “check in fatigue.” The only problem is that, as Check.in knows, Gowalla and Yelp APIs are read-only… for now. 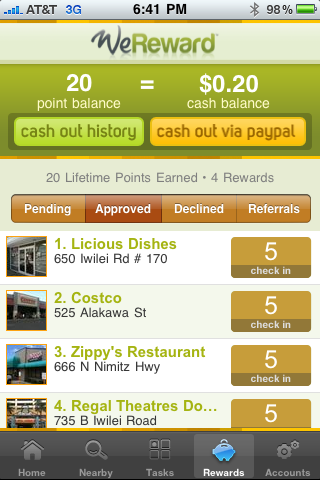 It’s way too early to pass judgement on WeReward, but I’m keeping it on my iPhone for now. (Greyed-out icons hint at plans for Android and BlackBerry versions.) Out of the gate, it’s a surprisingly polished and usable app. I’m curious whether and which local businesses will sign up, and until then, the national partners (and the tasks they dream up) will be fun to see. And a nickel is a nickel. But for me, at least, the money is secondary to the social piece. If MyReward remains a place where I’m alone in a world of advertisers, I won’t stick around for long. Thank you for the in-depth review and being an early adopter of the platform! We are looking in to how we want to incorporate social aspects in to the platform. We don’t want to make people “refriend”, and we don’t intent to replace any of the social games or networks out there. However, it would be cool to see some of your friends activity. Ted, looking forward to the social part of WeReward, especially not having to “refriend” my network. Whrrl does a good job at locating Facebook friends and Twitter followers on their network and holding in que those that aren’t, sending a notification when they do join the service. If Check.in can become the Ping.fm of location based services, it will be mayorships, badges, societies, and cash for us all! Thanks for the informative post. I haven’t tried ‘wereward’ yet, but I’ll give it a swirl. Geolocation marketing is becoming the next big thing and I’m interested to see how this will help real estate professionals in their marketing efforts. Thanks for your detailed comparisons. New location based services are popping up faster than I can keep up with. 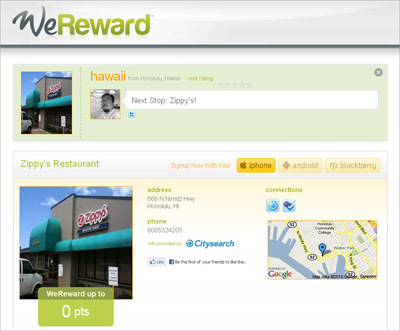 I am also testing out the WeReward site and find many of the businesses no longer exist. Some have been closed for several years. Also, new locations are not listed. I did take a photo with my Nikes for 50 points. Similar experience to April’s, some business are not really there currently. Perhaps fixing those bugs would make for a greater user experience.